We are former IRS trial attorneys who understand that dealing with a tax problem, whether it is a tax audit by the IRS or a criminal tax investigation, can cause emotional stress, strains on your relationships, and interruptions to your everyday life. Therefore, our tax litigation lawyers work not only to minimize the taxes our clients owe, but also to reduce their stress by taking the weight of dealing with the IRS on a day-to-day basis off their shoulders. There is a ton of information out there on the Internet; some of it self-serving, some of it contradictory, and almost all of it confusing. How is the average taxpayer to figure out what the best option is? The short answer is you need a tax litigation attorney who can review your specific situation, and give you the best possible advice. 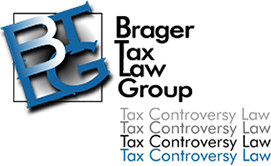 At Brager Tax Law Group, our tax dispute attorneys have over 100 years of combined experience in resolving tax problems like yours. At your very first meeting with Brager Tax Law Group you will sit down (whether in person, or by phone) with our founder Dennis Brager, a former IRS senior tax attorney, and California State Bar Tax Specialist, to begin the process of crafting a solution to your tax problem. That meeting will be the beginning of an ongoing partnership between you, and your tax controversy lawyers here at Brager Tax Law Group. Dennis will put his 40 years of tax dispute experience to work immediately to begin focusing on the solutions that will bring an end to your tax woes. We know that everyone’s tax problem is unique and we don’t believe in cookie cutter solutions to tax disputes. If we can’t provide you with a cost-effective solution that gives you excellent value, then our tax controversy attorneys will let you know before you spend tens of thousands of dollars unnecessarily. Here at Brager Tax Law Group, we believe that honest and open communication is pivotal to your financial and mental well-being. Having an undisclosed foreign bank account can create a very big tax problem. Starting in 2008 the IRS began stepped up enforcement of the long standing requirement that U.S. citizens, green-card holders, and other “U.S. Persons” report their foreign bank and securities accounts on a Foreign Bank Account Report (FBAR) aka FInCEN Form 114 (formerly known Form TDF 90-22.1. U.S. Persons with signatory authority over, or an interest in offshore bank accounts, are required to file no later than April 15th, although that time has been extended by the IRS to October 15th. The form must be filed electronically. Anyone with a foreign financial account, including an offshore bank account or an offshore securities account, who doesn't file an FBAR can be hit with both criminal tax penalties AND civil tax penalties. The criminal tax penalties are a maximum of $250,000, or five years in prison, or both. 31 U.S.C. 5322(a). Even if no criminal tax penalties are imposed, the civil tax penalties are ruinous. Pursuant to 31 USC 5321(a)(5), anyone who willfully violates the law can incur a maximum penalty equal to the GREATER of $100,000 or 50 percent of the entire balance in the account. In some cases the IRS will impose a penalty equal to 100% of the offshore account balance. We have represented hundreds of taxpayers with undisclosed foreign bank accounts, and our team of FBAR tax lawyers have saved them tens of millions of dollars by leveraging our deep understanding of the internal workings and procedures of the IRS. Let’s face it; tax litigation is not anyone’s first choice for resolving a tax controversy with the IRS. Nevertheless, sometimes it’s the only way to resolve a tax problem without rolling over. Tax litigation doesn’t always mean going to trial; sometimes filing a Tax Court petition, or filing suit in federal district court can create the opening for a better settlement. Our years of tax litigation experience give us the knowledge to move confidently ahead on our clients’ tax controversy matters, in the face of the 800 pound gorilla that is the IRS. At Brager Tax Law Group we have represented our clients not only in the U.S. Tax Court, but also in federal district court, Court of Federal Claims, bankruptcy court, and California State Superior Court. We have also represented clients in appeals in Federal Circuit Court, not only in the 9th Circuit Court of Appeals, but in the 5th, 11th, 6th and 2nd Circuits. Other tax attorneys, as well as CPAs, frequently look to Dennis Brager for expert guidance in tax litigation matters, and he has been retained as an expert witness to testify regarding IRS and California tax dispute matters. The IRS’s Criminal Investigation team, known simply as CI, has the task of prosecuting taxpayers who cross the line between simple errors and willfully violating the tax laws. Once CI refers a criminal tax case to the Department of Justice and a case is filed, the IRS has a conviction rate of over 90%. Almost 80% will do prison time. At Brager Tax Law Group, our team of ex-IRS trial attorneys and former tax prosecutors work tirelessness to make sure that a tax fraud case doesn’t reach that point. We look for the weak points to convince tax prosecutors that their time is better spent elsewhere. Our criminal tax attorneys can represent you from investigation through trial and sentencing, should that become necessary. Our criminal tax attorneys can also represent you in a civil tax fraud investigation where although your liberty is not at stake the civil tax fraud penalty of 75% can put in the poor house. When you are facing tax debt, the IRS has many tools at its disposal including serving a tax levy on your bank account, or your wages, seizing your home and other property, revoking your passport, and much more. Any of these actions can negatively impact your financial and mental health. Even though it seems like the IRS has all the cards, you have rights, including the right to consult one of our former IRS tax attorneys to help you obtain tax relief. As tax litigation lawyers with over 100 years of combined tax dispute experience, we will work with you to find a solution to your tax debt problems. Some of the resolutions we have arranged in the past include Submitting an Offer in Compromise to reduce tax debt, negotiating an installment payment agreement so that you can pay your IRS tax debt over as long as 10 years, and obtaining releases of tax levies, and IRS tax liens so that you obtain a loan to pay-off your tax debt. Our tax litigation attorneys frequently handle matters involving the California Department of Tax and Fees Administration (CDTFA), formerly known as the State Board of Equalization (SBE or BOE) on issues relating to California Sales and Use Tax. The California Sales and Use Tax is imposed on retailers and, if not paid, can become the personal responsibility of the business owner. The CDTFA employs a staff of several thousand individuals tasked with conducting Sales Tax audits and collecting unpaid California Sales and Use taxes. A California Sales Tax audit and its appeal is a complicated processes, requiring a knowledge of the California Sales Tax and Use Tax laws, as well as an understanding of the procedures of the CDTFA and the Office of Tax Appeals (OTA). While previously appeals were heard in an informal hearing before the five member elected Board of Equalization, now appeals are heard by a three judge panel of the Office of Tax Appeals. Technically anyone over the age of 18 years of age can represent you before the OTA, however, since the OTA procedures are tied to the California Administrative Procedures Act which allow for discovery, filing legal briefs, and potential hearsay, and other evidentiary objections it’s not optimal for taxpayers to be represented by anyone other than a California tax litigation attorney before the OTA. If your business has employees, you are required to pay payroll taxes. If you fail to do so on time, the IRS can impose interest and penalties, which, if left unaddressed, can end up larger than the amount of the payroll tax itself. Many businesses based in California facing IRS payroll tax debt also face State payroll tax problems, which our attorneys are equally equipped to handle. Even though the IRS has many weapons at its disposal, you have many rights, including the right to consult a lawyer to help you obtain tax relief. As tax lawyers with IRS litigation experience, we can help you alleviate types of payroll tax issues, whether that include submitting Offers in Compromise to relieve your payroll tax debt or negotiating releases of federal tax liens or levies. Of course, every case is different and you need an experienced tax lawyer to advise you on the best solution for your situation. Take the first step towards alleviating your payroll tax issue and contact our offices today to set up a consultation with one of our experienced tax litigation attorneys. Dennis Brager is a nationally recognized California State Bar Certified Tax Specialist and a former Senior Tax Attorney for the Internal Revenue Service's Office of Chief Counsel. He has been named by Los Angeles Magazine as a Southern California Super Lawyer. Dennis has written numerous articles on tax problems, and has been quoted as a tax expert by many publications including the Daily Journal, BusinessWeek, The National Law Journal, USA Today and Taxes - The Tax Magazine. He has also appeared on ABC Television's Good Morning America show, Fox Business News, TV One Access, and KSRO-Newstalk 1350. Fill out the form or call us at 800.380.8295 to schedule a consultation.